From 18K Gold Vermeil necklaces that carry your stash to leaf earrings, these are the 10 gorgeous pieces of designer cannabis jewelry you ever did see. One way to show off your love for the green stuff without doing too much is through cannabis jewelry. From 18K Gold Vermeil necklaces that carry your stash to sterling silver sativa leaf earrings, the possibilities are endless. But it’s not easy finding pieces that are both 420-friendly and classy. In fact, a lot of what you see out there are either too flamboyant or just downright tacky. So to save you the hassle, here are the 8 most gorgeous pieces of designer cannabis bling that you ever did see. 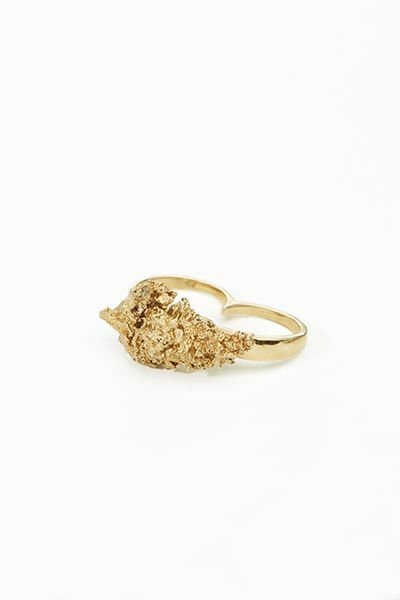 If rings are your thing, then check out this beauty from Jacquie Aiche. Not only is she paved with diamonds, but she’s also covered in gold. In fact, she comes in your choice of 14K yellow, rose, or white gold. And she’s available in most sizes. Oh, and just to throw it out there, Rihanna shops here, too. Whether you’re looking for a grinder or just want to keep your bud close by, this Locket Mill can help you out. And the best part of all, people will never know what’s inside. Designed by ASCHE Industries, this nifty pendant is available in 18K Gold Vermeil or Black Rhodium. Since a person can never have too many earrings, here’s a pair that you need in your life. These precious sterling silver cable chains by Genifer M may look intimidating, but they are made to thread through your ear lobes ever so delicately. Not to mention, they are the perfect conversation starter, especially when it comes to the topic of legalization. You’ve seen the necklace that can secretly hold on to your pot. But you also need a little something for those leftover blunt and joint roaches, so here you go. Thanks to its unique sliding mechanism, the Stoned Circle Necklace from the High Society Collection works as a clip for your clips. Just pull back on the stone, slip your smoke inside, and then move to stone back into its original place. Talk about fancy, huh? In case you’ve ever wanted to rock a golden nug on your finger, here’s a ring that’s totally bud-friendly. You won’t find a lot of details about it, other than the fact that it comes in silver, gold, and platinum. But you are free to contact Lost Track via inquiry form to answer any questions you may have, from pricing to availability. Fit for only a sophisticated cannabis queen, this lovely bracelet from The Toke Shop isn’t made from the fake junk. Rather, it’s filled with the highest quality 14k rose gold. And it also arrives at your door in an adorable jewelry gift box. If you’re looking for something a bit more affordable than the rest, check out this cute little stud. Not just any stud, but a Kush Stud. At the present time, IGWT NYC is fresh out of them. But hey, you never know when they might be back. Can you honestly say that you’ve seen a $15,000 joint? If not, now you can. But this isn’t your average joint if the price didn’t tell you that already. It’s a solid satin-finished 18K yellow gold lit joint. And it comes with 1.3 karats of 62 sapphires in shades of sunset-orange and silver. Oh, and 11 white diamonds, along with a 4.20mm (wink-wink) round green sapphire, all of which hang from a 19″ 14K yellow gold snake chain. It’s hella expensive but worth every penny. So, enough of all the necklaces and rings. Here’s yet another piece of jewelry from the Sweet Leaf Collection by Jacquie Aiche. Not only is this breathtaking anklet available in 14K rose gold, but also yellow gold and white gold, too. If you want to elevate your wardrobe, then this pin Genifer M is all you need. You can pair it with a casual getup. Or, even something fancy. There’s no better way to show that you support legalization than by sporting this THC molecule pin.